ARCADIA, Calif. — By the time a Thoroughbred enters the ring at the livestock market in Chino, located only about 25 miles east of Santa Anita Park, that horse has become anonymous. It doesn’t matter where it was bred, how many times it raced, or if it won or lost. Sharp buyers might know enough to check a tattoo, if they cared. But for the most part it’s a matter of meat on the hoof. On Feb. 2, a dark bay Thoroughbred mare with an irregular star and a sagging belly went on the block, and two bidders showed interest. One of them represented the international horsemeat industry, although he did not necessarily advertise the fact, while the other was bidding on behalf of a California equine retirement and rehabilitation organization. The hammer fell at $250. Most of the time the story ends there. The killer buyer somehow manages to transport the horse illegally out of California under false pretenses. Since there are no operating slaughterhouses in the United States right now, the horse will end up shuttled to Mexico or Canada, then slaughtered and exported in the form of supposedly edible fare. This time it was different. On this particular day, the Thoroughbred stepped on a van and headed not for some foreign slaughterhouse, but north to the California town of Tehachapi, to join the herd of about 100 retirees cared for by Priscilla Clark and a dedicated group of volunteers at Tranquility Farm, whose patrons include Gary Biszantz and John Amerman. When the mare arrived at Tranquility, she figured to be just another mouth to feed. She was welcomed with open arms, a thorough vetting, and the best grooming she had received for who knows how long. In the meantime, Clark commenced her usual research. It was discovered that the mare’s name was Isabel’s Pearl, a foal of 1994, bred in California by Edgar F. Cruft. She was a daughter of the stakes-winning sprinter Oraibi and the stakes-winning mare Moscow Pearls, a daughter of Moscow Ballet. As a 2-year-old, Isabel’s Pearl was sold for $2,000 at the April 1996 Barretts Equine auction in Pomona. The filly received her name from her new owner, Maria Isabel Moreno, and in 1997 she raced three times without success at Emerald Downs, near Seattle. As a broodmare, Isabel’s Pearl had three foals and one winner. 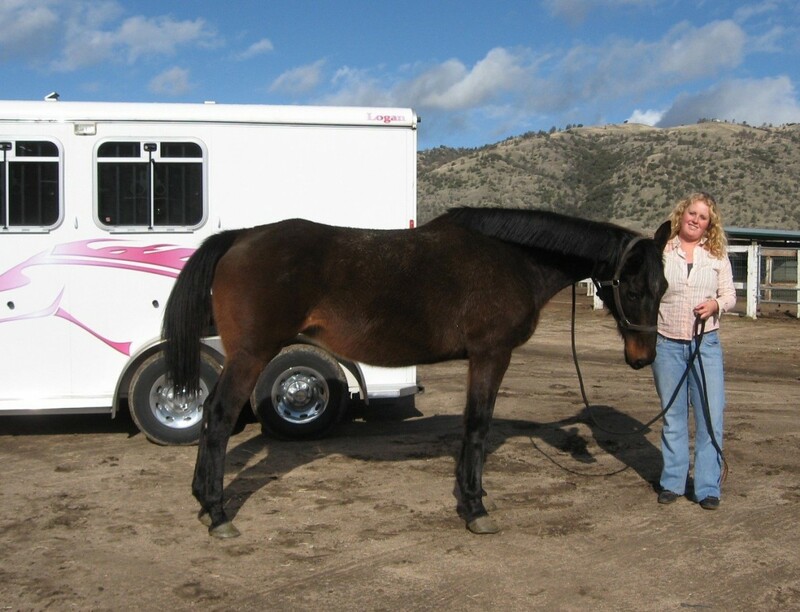 On Jan. 24, 2006, she was part of the Mary Knight consignment at the Barretts mixed sale. Entering the ring as Hip No. 568 of 586 cataloged, and believed to be in foal to Swiss Yodeler, Isabel’s Pearl brought a winning bid of $3,000 by a purchaser named Isaac Vizcorra. She had no registered foal in 2007. Her next public appearance of record was at the Chino livestock auction. Clark sighed. She has seen this movie before. “With feed prices high and yearlings worth half what they were, we’re seeing a lot of Thoroughbred broodmares showing up at livestock auctions this winter,” Clark said. And so, rather than being humanely euthanized, retrained, or merely retired to pasture, Thoroughbreds are simply dumped onto what is now an underground meat market. Clark continued her research, plowing back through the female family of the discarded Isabel’s Pearl. Moscow Pearls was a daughter of Thaliard’s Pearl, who in turn was a daughter of Jan Jessie, one of the fastest fillies in the West from 1968 through 1970. Jan Jessie was a daughter of Pearl, and Pearl was a daughter of Sea Treasure, who was foaled in 1945. It was Sea Treasure’s sire, however, who sent Clark through the roof. His name was Seabiscuit. At such moments of apparent destiny, things tend to move quickly. Clark immediately called the Seabiscuit Heritage Foundation in Willits, Calif., which is dedicated to the preservation of a 5,000-acre piece of the Ridgewood Ranch owned by Seabiscuit’s owner, Charles S. Howard. The foundation had reached out to Clark and other rescue and retirement groups to let them know they are looking for descendants of Seabiscuit to live at Ridgewood, where Seabiscuit healed during his racing career and stood at stud when he was retired. Happy endings don’t just happen. It took a diligence, contacts, and perseverance to pull this off, otherwise Isabel’s Pearl, bred to perform for the pleasure of her people, would have been slaughtered and consumed. Instead, on Friday morning, a great-great-great-great granddaughter of Seabiscuit was loaded onto a trailer at Tranquility Farm to embark on the 400-mile journey to Ridgewood Ranch, where she will be officially presented to the public in an open house this May.